We brought our German Shepherd puppy home almost two weeks ago. My husband leaves for work at about 7AM. I am fortunate enough to have to be at work at 9....so for two hours each morning its puppy time with me and Sable! Yesterday morning as I was putting my contacts in, Sable decided it was a good opportunity to take Daddy's slipper and run! She ran right into the bathroom, dropped the slipper in the toilet and then sat and stared at it for a minute. By the time I saw this happen I was laughing so hard tears were running down my cheek. Sable rushed over and began licking my hand to make sure I was okay..
She is such a doll and even though she has jumped in the tub (while I was in it, bubbles and all...) and has attempted slipper murder we still love her with all of our hearts! 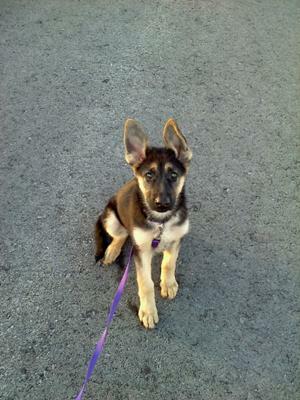 Hey, Andrea, Thank you so much for sharing your great story about your new German Shepherd puppy. What a wonderful story - it's great to hear how happy and playful she is.